September 30, 2011 has been designated as the official Press On Day to CURE Childhood Caner. Please take a moment to read up on all the momentum behind the multiple fundraisers planned for this special event. On a day dedicated to raising money for childhood cancer research, several area schools and businesses will hold fundraisers Friday to reach a goal of $100,000. 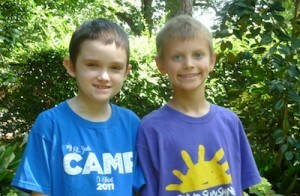 Press On Day will help the research fund inspired by childhood cancer patients Patrick Chance, of Atlanta, and Brennan Simkins, of Augusta. The events held on the last day of September will conclude Childhood Cancer Awareness Month but also motivate people to continue raising funds throughout the year. People from Augusta and across the country who have followed the stories of the two cancer patients have raised money for a cause they believe in and want to support, Tara Simkins said. After the success of last year’s drive, many people said they wanted to make this year’s event even bigger, she said. “It’s the grass-roots nature of it where everyone feels empowered to go out and do their own thing,” she said. Individual contributions and lemonade stands in Atlanta and Vidalia, Ga., have raised more than $31,000 this month, Simkins said. Last year, donations totaling $103,000 far surpassed the $20,000 benchmark. Students from St. Mary on the Hill Catholic School will exchange donations for the chance to dress out-of-uniform for the day. Hull Barrett, an Augusta law firm, will also hold a casual dress day for their employees. Absolutely, the most significant factor that is considered while purchasing medicaments from the Web is to make a best choice. To purchase medicaments online from a privileged web-site is safe. Other medicaments are used to treat complaints such as hair loss. What about buy propecia online and alopecia? Very likely every adult has heard about buy propecia. (Read more finasteride online). A extended medical condition present is hair loss. What medicine does treat alopecia? Most of patients using this medicine mostly do not have any side effects to Finasteride. Even if this drug is not for use in women, it is not known whether this generic could detriment a nursing baby.